My drawings are based on my personal experience with the agricultural industry. I grew up in an agricultural environment and I’ve been connected to the fields since I was a kid. From my experience as a farmworker, I conceived of a project that involved a non-traditional collaborative with industrial printers. 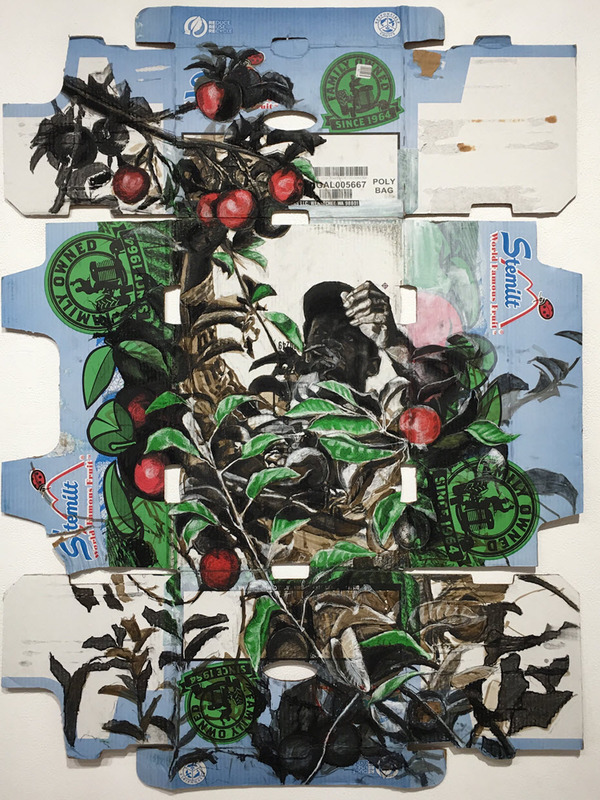 Influenced by masters such as Millet, Van Gogh, and Siqueiros, I attempted to start a dialog with the food industry by contrasting the agribusiness with its laborers. 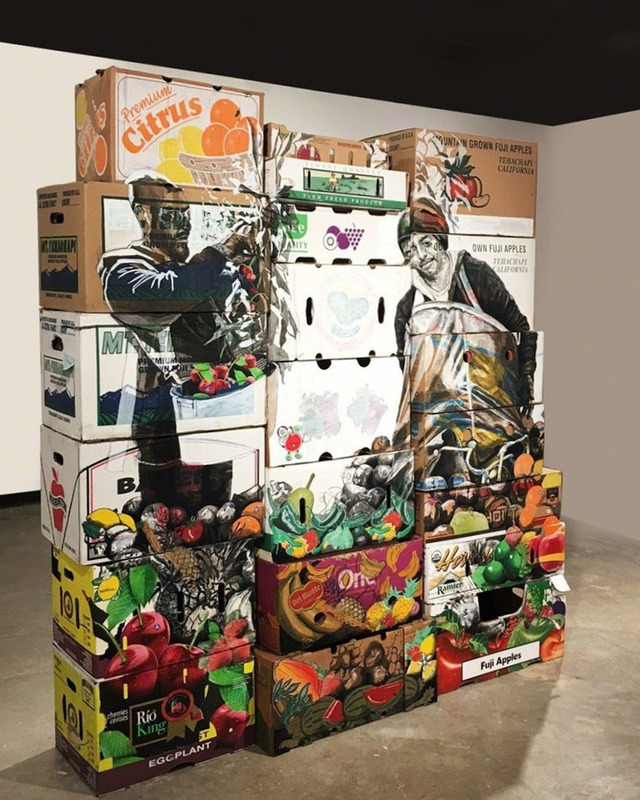 I chose agricultural workers and drew them on produce cardboard boxes collected from different grocery stores, and this was the beginning of this project. Working in the fields for many years has made me realize that there is a big difference between the lifestyles of the workers and that of the agribusiness owners. The majority of the farmworkers live in an economic struggle every day to sustain their families and to provide them with the basics. Meanwhile, the plantations keep multiplying and the owners are provided with a life of luxuries. 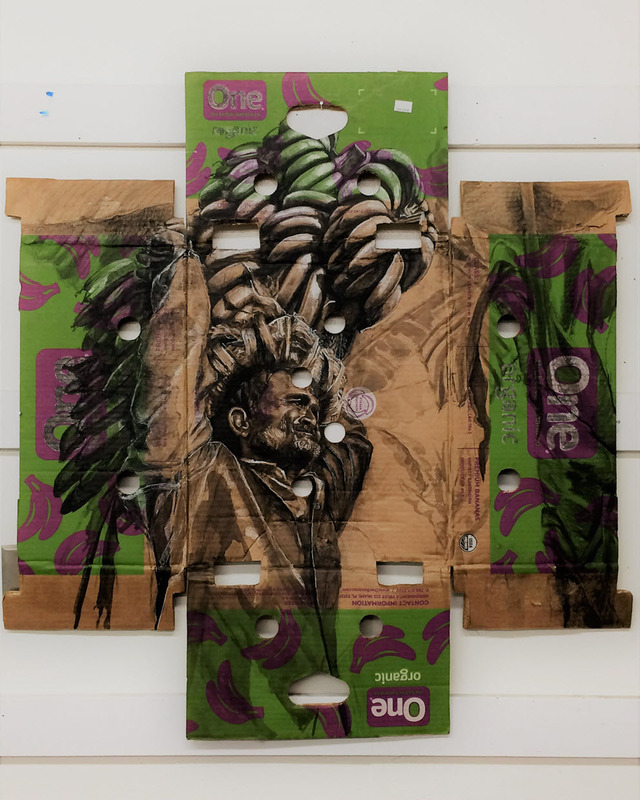 I aim to contrast the disparities of lifestyles between workers and owners through the usage of symbols, some found on the used boxes and others produced through the art making process. Because of my personal experience, I admire artists who have depicted the harsh living conditions of their social groups and time period. Artists such as Jean-François Millet, Vincent Van Gogh, and David Alfaro Siqueiros have inspired my vision. Jean-Francois Millet (1814-1875) was born in a farming community. As a young man, he worked in the fields in a small village in France. Later in his life, he went to art school and became well known for his paintings depicting the peasant and farmworkers life struggles. Another artist who I admire for his peasant and farmworker subject matter is Vincent Van Gogh (1853-1890). Many biographies and the artist’s own famous letters point out how Van Gogh admired and studied Jean-Francois Millet as an artist. He was born in southern Netherland but moved to France and with the help of his brother, Theo Van Gogh, he produced a large amount of art work which, after his death, became known worldwide. Another artist who made me feel I should pursue work which comments on current social issues of the time is the Mexican muralist David Alfaro Siqueiros (1896 – 1974). Siqueiros believed art should be available for the masses. He produced murals and prints commenting on the social injustice towards the proletariat in Mexico and abroad. I feel my work is related to the peasantry, the landscapes, and the scenes of social economic inequity, which are the legacy of these masters. In my work, I include farm workers, some in their everyday settings and some as portraits. I use collage, ink, gouache, charcoal and cardboard boxes for support. With vine charcoal, I start to draw the composition and linear structure. With white gouache, I tone down printed areas to integrate the drawing. Then, I proceed to define shadow edges to clarify light and shade. Next, I use ink washes to generalize the tone of the whole composition. Finally, I use compressed charcoal and charcoal pencils to emphasize desired areas with details, creating a dialogue between the dark and messy charcoal and the colorful and neatly prints on the boxes. 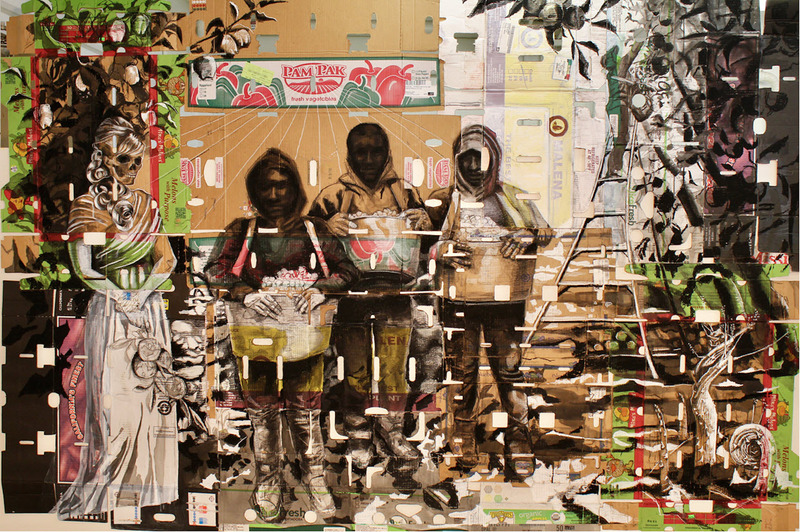 Through the juxtaposition of produce labels from reclaimed produce boxes and the drawings of agricultural workers on those boxes, I attempt to create unique compositions that allow me to reflect on the differences in social lifestyles and the questionable economic systems that contribute to it. At the same time, I see my work as a possible catalyst for discussions about the common ground between the well-off and the less fortunate. 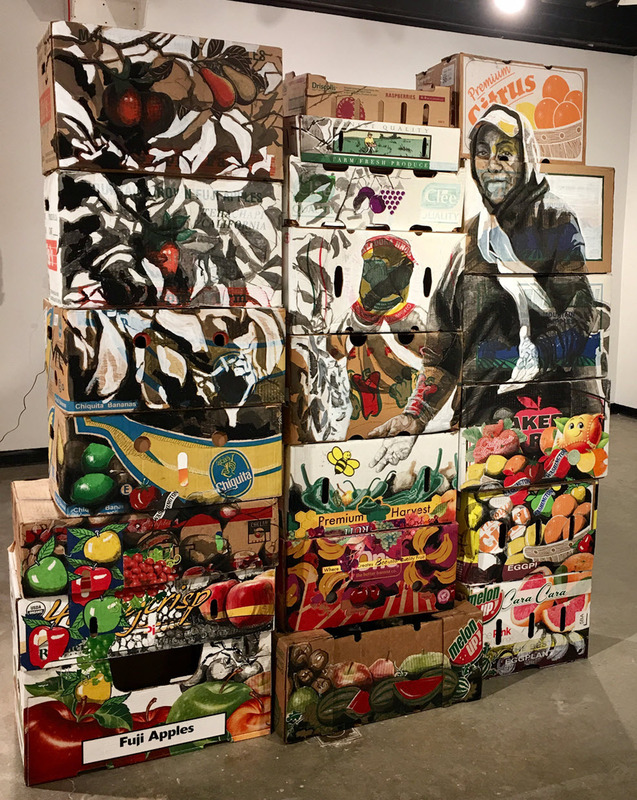 2018 MFA Drawing and Painting – California State University Long Beach. 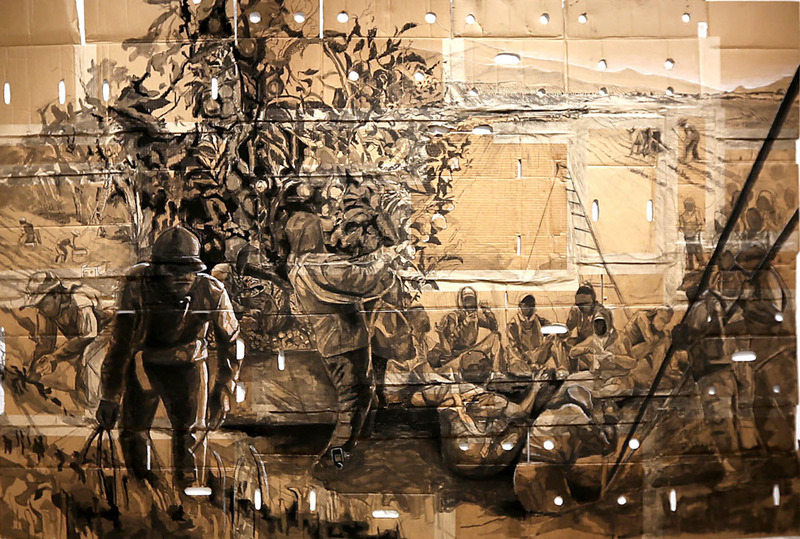 2012 BFA Drawing and Painting – California State University Long Beach. 2009 AA Art – Los Angeles City College. 2018 The Embodiment of Inclusivity, Xiem Clay Canter, Pasadena, California. 2018 Praxis, LBMAX, Long Beach California. 2018 New Impressions National Printmaking Competition, Sawtooth’s Davids Gallery, Winston-Salem, North Carolina. 2018 Immigration 101, Avenue 50 Studio, Highland Park, California. 2018 Painting the Night, Midnight Gallery, Long Beach, California. 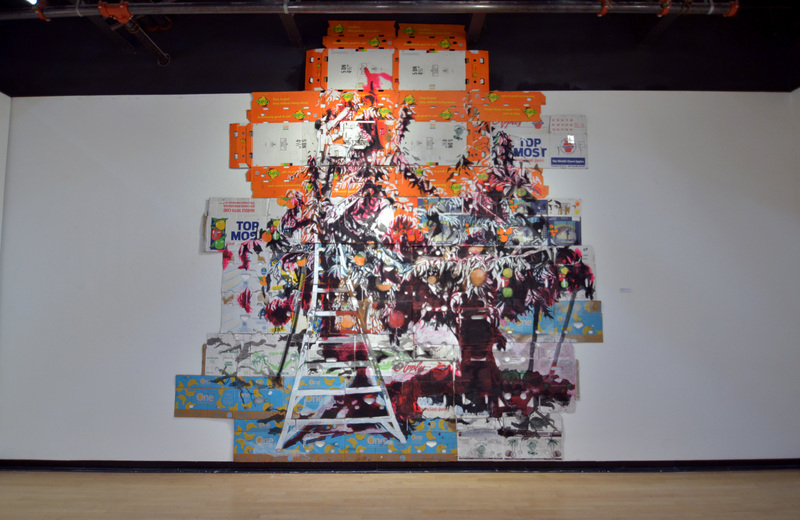 2018 Visual Resistance, Fullerton College Art Gallery, Fullerton, California. 2017 Farm to Table, Brainworks Galley, Los Angeles, California. 2017 PUMP, Public Urban Multisensory Presentations, The Packard by Millworks. Long Beach, California. 2017 Here/There PST LA/LA, FM Fine ART Gallery, Los Angeles, California. 2017 Borders, Angel City Brewery, Los Angeles California. 2017 Postura, PST LA/LA/SUR Biennial, Whittier Historic Museum, Whittier, California. 2017 Spacial Recognition, Finishing Concepts, Monterey Park, California. 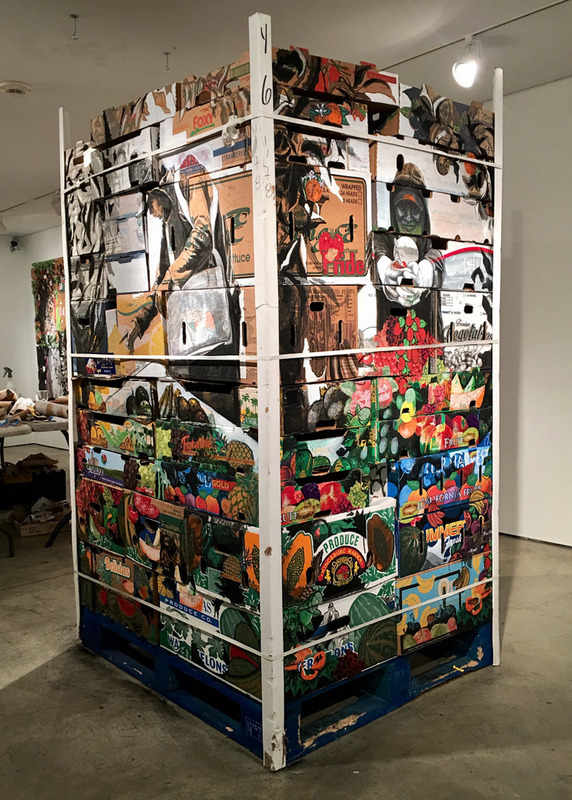 2017 Cross Town Traffic, Manhattan Beach Art Center, Manhattan, California. 2017 Sustainability Show Case, Earls Burns Miller Japanese Garden at California State University Long Beach, Long Beach California. 2017 Defend and Advance, National Immigration Law Center, Los Angeles, California. 2017 Verge 2017, South Bay Contemporary, San Pedro, California. 2017 Insights 2017, University Art Museum, Long Beach, California. 2017 State of the Union, Brainworks Gallery, Los Angeles, California. 2017 Far Bazar, Cerritos College, Cerritos, California. 2017 Dear President, South Bay Contemporary, San Pedro, California. 2016 Arcadias, Werby Gallery, Cal State Long Beach, Long Beach, California. 2016 Tracing Tomorrow, Collective Arts Incubator, High Land Park California. 2016 Final Mass Attack, Torrance Art Museum, Torrance California. 2016 System and Process, Angel City Brewery, Los Angeles, California. 2016 S/Election, Los Angeles Municipal Art Gallery, Los Angeles, California. 2016 Contemporary Prints, Arts Council of Greater Baton Rouge, Baton Rouge, Louisiana. 2016 Now Trending, Palos Verdes Art Center, Rancho Palos Verdes, California. 2015 Insights 2015, University Art Museum, Long Beach California. 2014 Getting Off The Ground,  Angels Gate Cultural Center, San Pedro, California. 2013 California Dreamers, Gatov West gallery at Cal State Long Beach, Long Beach, California. 2012, Insights 2012, University Art Museum, Long Beach California. 2012 Californians, Art Space Purl art gallery, Daegu, South Korea. 2018 Farm Fresh, Long Beach Museum of Art, Long Beach California. 2018 The Harvest, Center for Culture and Cinematic Arts, Mexican Consulate in Los Angeles, California. 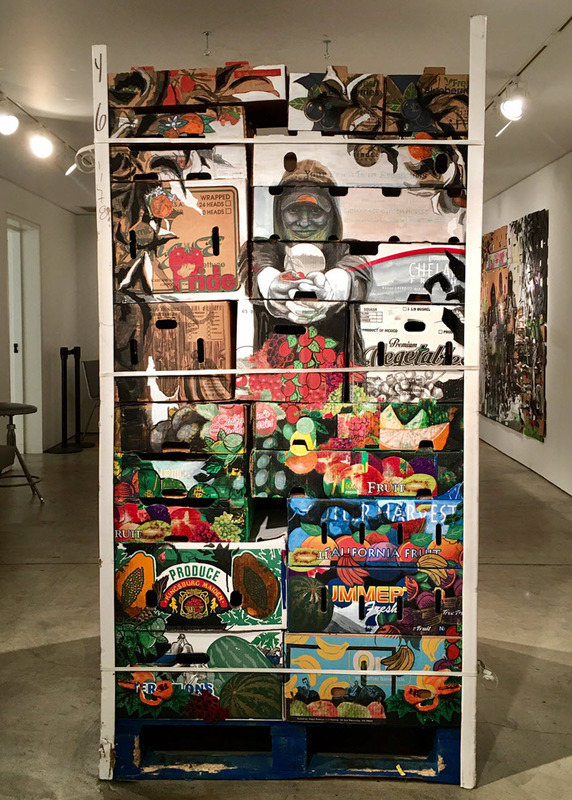 2018 The Harvest, E. Gatov Gallery at Cal State Long Beach, Long Beach, California. 2013 Labor of Love, Dutzi Gallery at Cal State Long Beach, Long Beach, California. 2018 1st Place Graduate Speedball New Impressions National Printmaking Competition. 2018 Dedalus Foundation MFA Fellowship in Painting and Sculpture. 2018 Artist in Resident Long Beach Museum of Art, Long Beach California. 2018 Artist in Resident Long Beach City college, Long Beach, California. 2017 Artist in Resident Long Beach Museum of Art, Long Beach, California. 2018 Oaxaca-born Artist Paints Life in the Fields in First Solo Exhibition at Long Beach Museum. 2018 Farm Fresh – Narsiso Martinez – Short Doc, 2018. 2018 The Personal and Political Landscapes of Narsiso Martinez.